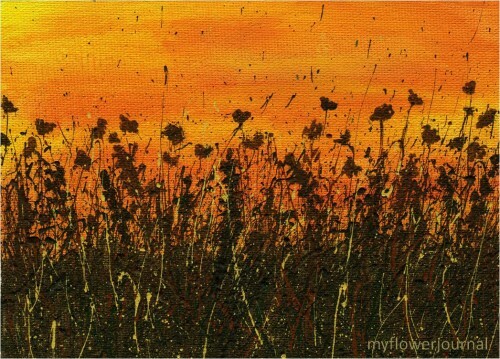 I have some new splatter paintings to share with your: Sunflowers, Sunsets and Late Summer Wild Flowers. I recently added my name to Leslie Saeta’s 30 paintings in 30 days challenge. I’m already a few days behind so I have a little work to do to catch up. My friend Leigh Anne Wilkes was visiting in Utah this week and asked if she could come over and do some splatter painting with me. We had a fun morning splattering paint, visiting and sharing ideas. These are the paintings I did that day. I tried to do some paintings that had more of a late summer or fall look. 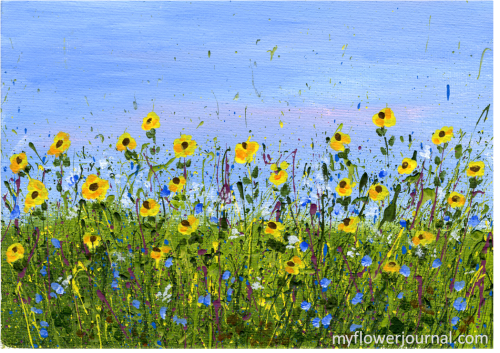 I tend to be drawn to spring and summer colors so most of my paintings reflect those season. I tried to use some fall colors in these 5×7 pieces but they probably still look a little more like summer than fall. You can learn how I do my acrylic splatter paintings here and here. When I get a few minutes, I do practice with the splattering, but I’m a ways from getting it right just yet! However, I’ll keep on keeping on! I do love the wee things you do, right up my alley! What a great talent,those are beautiful. Beautiful paintings. You are a great artist. I have plans to visit the Botanic Park of my country in order to take flowers pictures. I will send you an invitation to see my pictures. This is my first time to your blog. I’m fascinated with the spatter painting! Love the sunflowers. I might have to read through the tutorials and give this a try! Your splatter paintings are always so inspiring. Beautiful and artistic flowers, yellow, blue and violet, all are so wonderful. I like them all. I have left only yellow in my garden. Oh wow, these are really fantastic, lovely work! 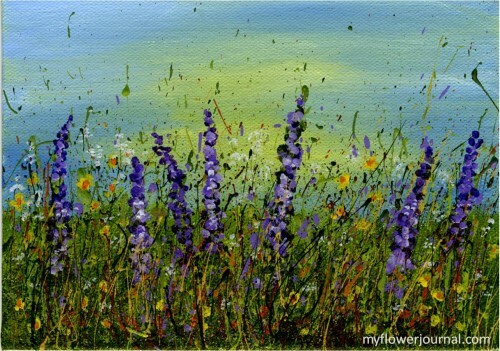 If I am honest I am not really a fan of flower art- but yours could change my mind. love them.Happy PPF. Gorgeous !Who knew splatters could be so stunning!! I really love your splatter paintings. The splatters add a kind of vibrancy and movement to them. Love your colour choices too! 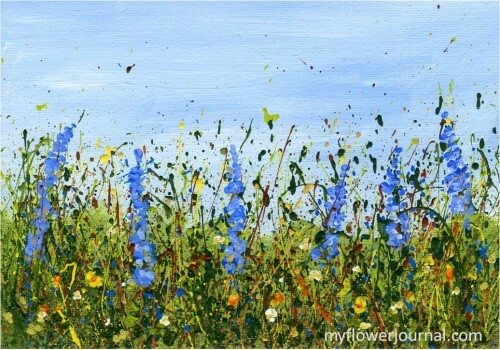 These paintings are absolutely lovely and full of the wonderful energy of growth! Hello, I’m here from Brenda’s. Just wanted to say I love your art! I would love it if you would join me for Fresh-Cut Friday! Your paintings would be a wonderful addition. beautiful florals!!! !Have a wonderful weekend!!! so beautiful Tammy-love those sunflowers!! Your splatter art is amazing. Each one is so beautiful. your splatter paintings are beautiful and free feeling. 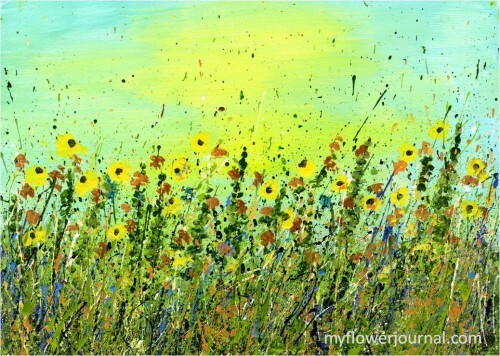 STUNNING array of splatter painted sunflowers and wildflowers, in different light, all luminous and lovely!! Gorgeous! You are such an amazing artist! I love how the colors just pop out at you. Thanks for sharing with SYC.